So…we’ve decided to throw a Hawaiian-themed party for her here at the house. We were on vacation in Hawaii when we found out we were pregnant, so it seems like a fitting first birthday theme. But, I cannot decide on invitations. These are the Etsy designers I’m considering. Most of them will do whole suites themed around the invite: dessert table signs, labels, banners, thank you cards, etc. 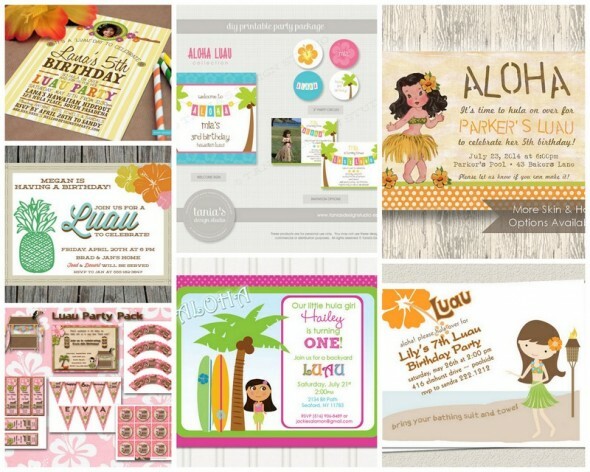 From top left, going clockwise: Luau Birthday Invitation from Design’d To Party; Aloha Luau Party Package from Tania’s Design Studio; Vintage Luau Invitation from Bee and Daisy; Luau Hawaiian Pool Party invite (it will not be a pool party) from Eclectic Note Cards; Hula Girl Invitations from Ginger Snaps Originals; Luau Party Pack from Decidedly Digital; and Retro Tiki Hawaii Printable from Print Your Heart Out. So many decisions! I need to make this one soon so we can move forward.